PRINCETON, NJ -- U.S. satisfaction suffered a setback this month, after a two-month upswing. Twenty-two percent of Americans say they are satisfied with the direction of the country, down from 28% in July and 27% in June. Three-quarters of Americans are now dissatisfied with the nation's course, up from 68% in July. Given the decline, America's mood is now on par with the lowest readings seen since early 2012, including March of this year, when 21% were satisfied. Democrats maintain higher satisfaction than either political independents or Republicans, a pattern seen throughout President Barack Obama's White House tenure. Nevertheless, their satisfaction fell seven percentage points this month (from 44% to 37%), consistent with the six-point drop among Republicans (from 14% to 8%), and slightly greater than the four-point drop among independents (from 25% to 21%). 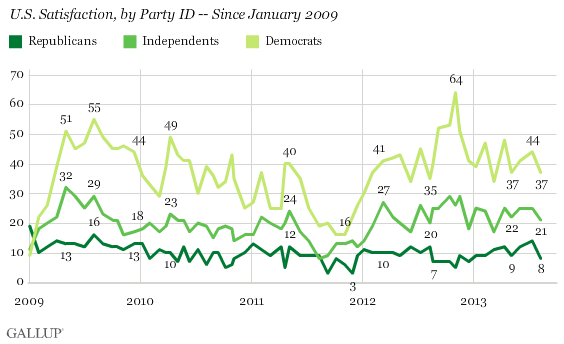 Thus, satisfaction among all three party groups now approaches the low points seen since 2012, while still registering above the lows reached in mid- to late 2011. Those lows occurred after the near-crisis on Capitol Hill and Wall Street over raising the nation's debt ceiling. 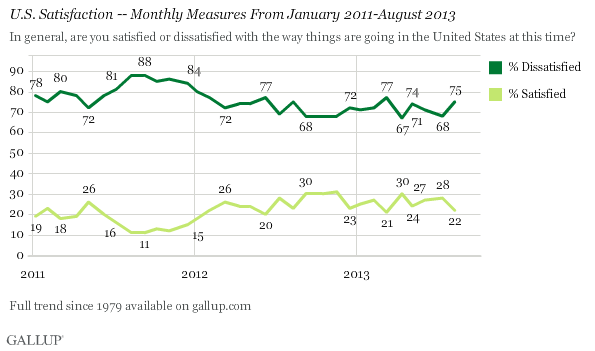 It appears this month's decline in satisfaction has more to do with politics than economics. Although President Obama's job approval rating is roughly the same in August as it was in July, his disapproval rating is up three percentage points, to 50%. This is based on comparing the Aug. 7-11 poll with Gallup's July 10-14 survey, when satisfaction was last measured. Underscoring the downtick in presidential approval, Gallup Daily tracking shows an even an even more pronounced decline in Obama's job rating between the two time periods. Conversely, Gallup's Economic Confidence Index, based on Gallup Daily tracking, was slightly higher in the days spanning the August satisfaction reading, at -9, than it was spanning the July reading, at -13. Also, the Gallup Job Creation Index was essentially unchanged across the two time periods. At 22%, U.S. satisfaction with the direction of the country is the lowest Gallup has seen since March. This follows several months when the reading reached or approached 30%. And while satisfaction has declined among all party groups since July, the reason for this is not clear. Although the economy might be an obvious culprit, Gallup's economic indicators find no change -- or even slight improvement -- in Americans' broad view of the economy and employee perceptions of job conditions where they work. 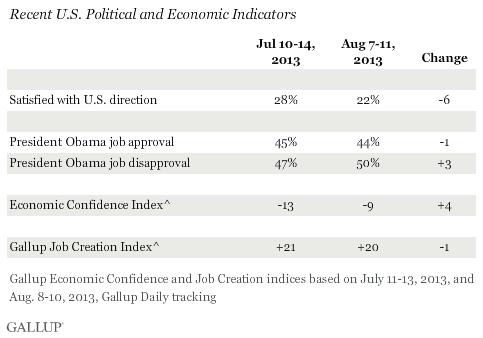 At the same time, Obama's net job approval rating has dipped somewhat since July. It thus appears that something other than the economy is causing Americans to be less pleased with the president as well as the overall direction of the country. Results for this Gallup poll are based on telephone interviews conducted Aug. 7-11, 2013, with a random sample of 2,059 adults, aged 18 and older, living in all 50 U.S. states and the District of Columbia. Gallup's U.S. Economic Confidence Index slipped to -12 in July from -8 in June, as Americans' economic outlook soured more than their views of current conditions. Confidence declined across income and age groups. U.S. self-reported daily consumer spending was $89 in July, unchanged from the $90 of June and May. Average daily spending rose to $98 in the East in July, from $84 in June, but was offset by declines in the Midwest and South.